call me crazy but i've already begun to compile a list and collect goodies for big H and little h's 4th and 1st birthdays this year. i adore sweet lulu's party supplies. 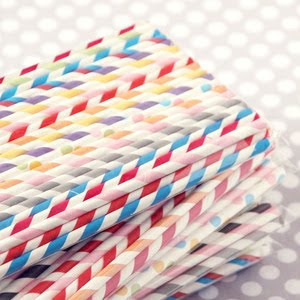 everything from the classic striped paper straws to the polka dot balloons. i have a collection of adorable vintage hankies that i've been toting from home to home. i was waiting for the perfect project... and i think i may have found it here. if you're getting hitched or a fan of gorgeous stationary, take a peek at chocolate butterbean. their designs are delicious! a little early to be scouting stocking stuffers... but how sweet are these cute as a button letterpress coasters?! my 3 year old has learned how to draw hearts and it sprung a mini obsession with all things shaped like so. what better to feed a picky preschooler than her fave shape? check out this collection of heart-shaped recipes! last but not least, i'm writing a 32 before 32 list. my birthday is in october. though with two children, the list isn't too terribly indulgent... i won't be climbing mountains or traveling the world, i'll be accomplishing little things i've been craving to do. i'm excited to share this list with you soon! what would be at the top of YOUR list? Great links! I've been searching for some cute drinking straws for my sister's baby shower and will definitely check out that shop. Thank you!